As a Disney fanatic, the word of the year has definitely been ‘Frozen.’ Anna, Elsa, Sven, Olaf, Kristoff, ‘Let it go’… if you aren’t familiar with Frozen, I’d love to see the rock you’ve been living under. 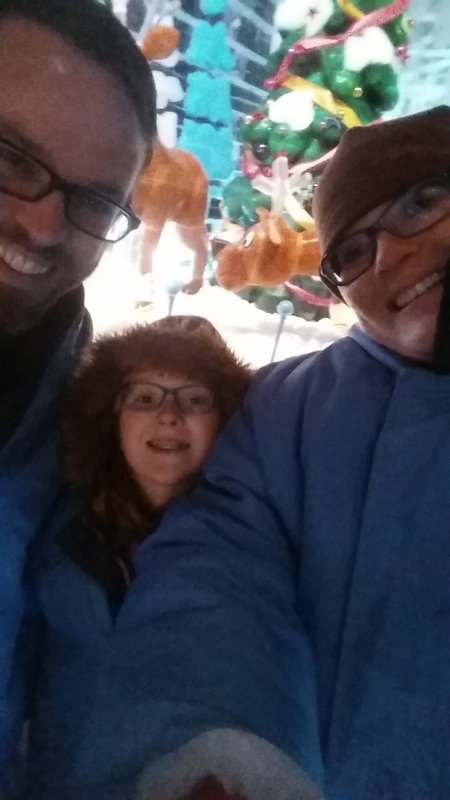 As a Christmas gift to ourselves, my family and I decided to get a little ‘frozen’ for real. 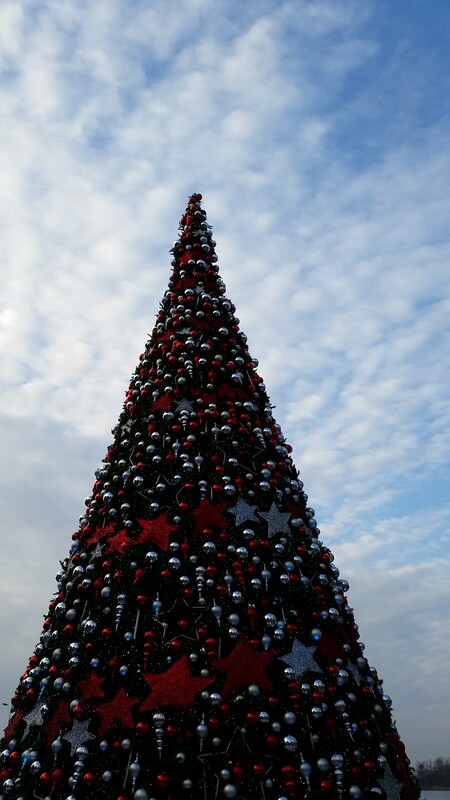 Back in September, we visited the Gaylord National Harbor resort near Washington DC for the kiddo’s birthday. I promised her when we left that we’d be back soon and a Christmas getaway seemed like the perfect opportunity. 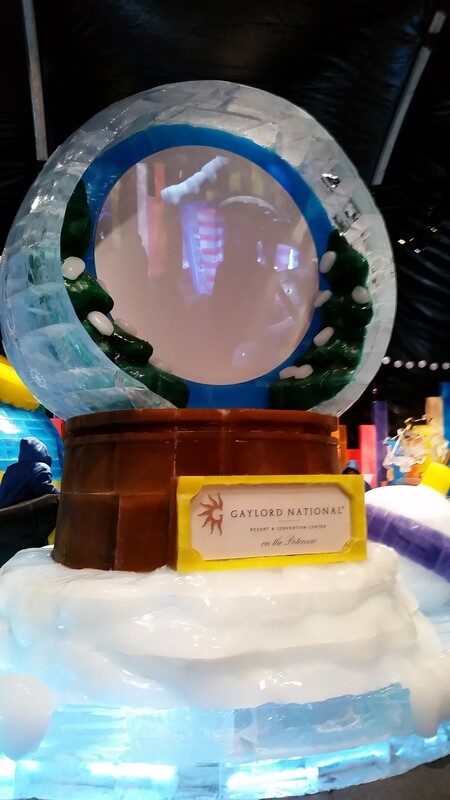 The Gaylord offers an event called ‘Ice!’ each year in November through New Years. Ice! 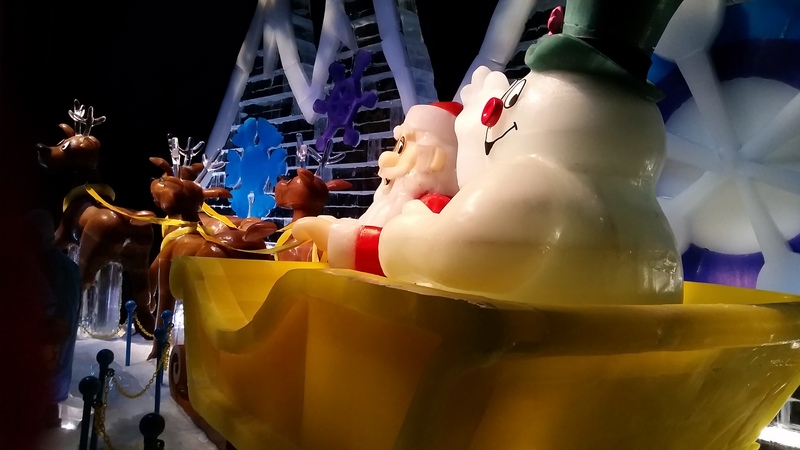 is basically a giant tented area on the grounds of the resort that is filled with ice carvings themed like Frosty the Snowman that will blow your mind. There’s even an ice carver actually carving toward the end of this walk-through event. These carvers come from Harbin, China, where ice carving and these sculptures are world famous. Signage at the exhibit noted that something like 11,000+ hours were spent working on this years Ice! event. Ah-mazing. 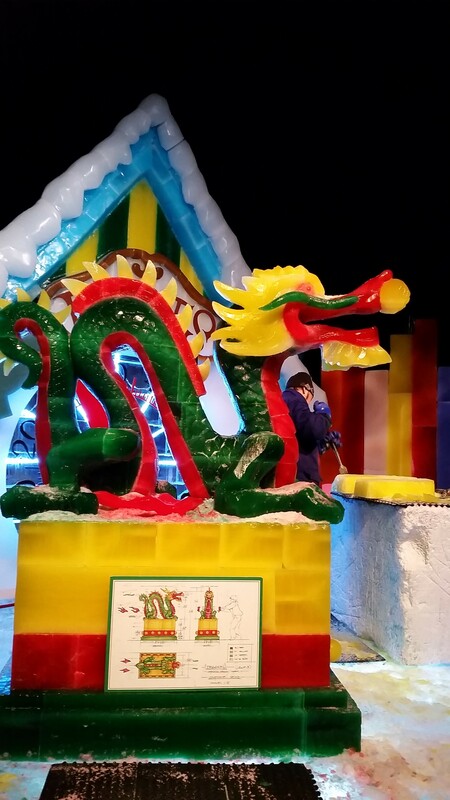 You can even enjoy one of the ice slides where you can slide like a kid over and over. So it is an ice sculpture thing, a given that it is cold. How cold? Uh, nine freakin’ degrees. Yes, 9. I thought we prepared for the cold with our winter coats, gloves, scarves, hats, etc. but nope. Before you can go into the tent, you are given a big blue parka to put on OVER your coat. I looked like a gigantic blue marshmallow. Don’t lose your family in the crowd because everybody looks the same. I was not pleased to be wearing my already huge coat with this big ‘ole parka on top but as soon as I was in the tent for a couple of minutes, I would’ve liked a third layer. It was COLD. How cold, you ask again? So cold that my smartphone stopped responding when I tried to take pictures using it. Now I don’t know if it had decided that it wanted back in my pocket and the screen was too cold to register my touch or if my fingers stopped feeling human. Probably a little of both. The good thing is that the tent isn’t huge so when you leave you aren’t frostbitten but pretty close. You definitely aren’t going in there to hang out for a long time. We went into Ice! twice during our stay and that second time was much better than the first. We knew what to expect that time around so we weren’t so shocked by the cold. I knew my phone was going to be unhappy so I tried to keep it as warm as possible. We saw things we didn’t see the first time around and got to watch the ice carver working more which was super cool. What else did we do? Well, I booked the ‘Christmas on the Potomac’ package which gave us unlimited admission to Ice!, a free photo of our family during the event, our night’s accommodations at the Gaylord, and a $100 resort credit. We had a Madagascar themed character dinner in the hotel at Pienza which was yummy to use up that credit. Alex the lion, Skipper and Private the penguins, and Mort the lemur were on hand to take photos with the kids. Mort was so cute! The food was buffet style and even had Peeps! National Harbor has a Peeps and Company store with all kinds of the marshmallow goodness and they are one of my favorite little treats. We got a superb upgrade at check-in to an atrium view room which gave us a balcony room on the 9th floor overlooking the atrium (duh, atrium view!) We got to watch the nightly tree lighting and fountain shows which were so much fun from the balcony. The resort was PACKED with day guests coming in for Ice! so seeing those shows from ground-level would have been a challenge. Atrium view rocked but I don’t know that I’d pay the extra $200/night to get it. There was also reindeer scavenger hunt throughout the atrium and lobby for a Dreamworks treat (candy cane) and a chance to win a future visit. That was a lot of fun for the kid but quite a bit of work with the number of people everywhere. Another great trip to the Gaylord, complete with spinning doors to make Hailey happy and time away to please us all. We’ll be back again — I’m thinking spring! ← A Frozen giveaway just in time for the holidays!